For this reason Ceiling and Roof Insulation is one of the best investments for your home. Installing Isotherm Insulation or Aerolite Insulation will reduce the heat flow in and out of your home. In summer these insulation products will improve the temperature in your home significantly. Ceiling insulation reduces the heat flow from the roof through the ceiling into your home in summer. In fact, in summer the roof area of your home is like an OVEN. This heat is like a pressure cooker and the easiest way out is through the thin rhino board ceiling and into your home. Once Ceiling Insulation installed correctly home comfort levels improve substantially. Creating a barrier barrier that reduces the heat flow by up to 80%. As a result ceiling insulation reduces heat flow up or down. Therefore on its own Insulation will drop the temperature in your home. Ensuring a much cooler 4 to 8 degrees in some homes. If you are using air conditioners it will cut down your energy bill dramatically. In this case, you can run on a lower setting and your air conditioner will not have to run continuously. In fact, the thermostat will kick in far less frequently than before the home was insulated. A home insulated with the correct thickness insulation will be cool in summer and warm in winter. In fact, correctly insulated homes will have an improvement of 4-8 degrees. Make sure to install the correct R-value for the region that you live in. And therefore also increase the value of your property. As your home can then be sold as insulated and SANS compliant. Many of the new property buyers on the market today are all aware of energy saving as well as the environment? A well-insulated home will recover the cost of insulation in approximately 2 to 3 years. There are a number of Ceiling Insulation products on the market in South Africa. However, all legitimate Insulation products must be SABS approved and must be SANS compliant. It is pointless installing Insulation products that are not SANS compliant in South Africa. In fact, all Insulation must be tested by TIASA for the fire rating. 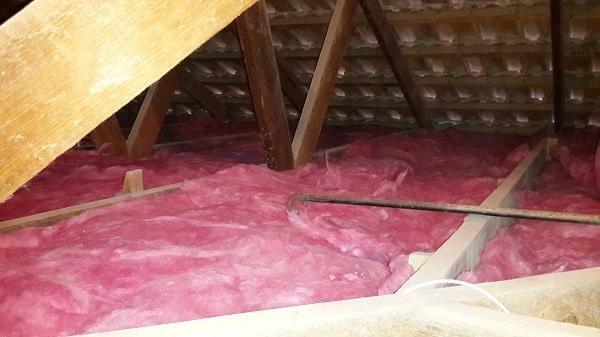 Installing Insulation that is not tested according to legislation can be an expensive option if your house burns down as a result of a roof fire and untested Roof Insulation has been installed. As it is possible to have the insurance claim rejected. All Ceiling Insulation products that are SABS tested and Tiasa approved will have the correct R-value for the region that you live in. Additionally, they will have a specified fire rating. There are a good few Types Insulation for Ceilings however we only install the most effective insulation products. Isotherm Insulation is a polyester insulation products manufactured to SABS standards. Regarded by many as their Ceiling Insulation of choice. Especially because Isotherm Ceiling Insulation is DUST FREE & ALLERGY FREE. Moreover this insulation is produced fro PET plastic bottle pollution. Consequently Isotherm is an Eco-friendly ceiling insulation. Aerolite glass-wool Ceiling insulation is one of the highest grade insulation products on the market. Considering that Aerolite or Think Pink Aerolite as it was known in the old days when insulation for ceilings was hardly thought of. On the other hand today Aerolite is one of the most developed and tested insulation products available. As a result of the new technology Aerolite is now Formaldehyde free. For this reason and the Aerolite fire rating this product is specified for high volume traffic areas like hospitals, schools and shopping malls. Aerolite has one of the highest thermal insulation properties available. As a direct result this ceiling insulation will improve indoor temperature 4 – 8 degrees. Knauf Ecose Ceiling Insulation is an earth-wool product. Additionally Ecose Insulation is also Formaldehyde Free. As a result Ecose Ceiling Insulation is specified for Hospitals, schools and public areas as well. Knauf Ecose Insulation is manufactured in Germany. Additionally Ecose is great for temperature control in the home as well as soundproofing. Improving indoor temperature 4-8 degrees. Installing Insulation in your home with professional Ceiling Insulation Installers will not only save you money but also give your home years of energy saving benefits. Insulation not installed correctly is wasted money. Unless you Install the Insulation 100% correctly it will be a waste of money. For DIY insulation installers, we give telephonic support to help install correctly. 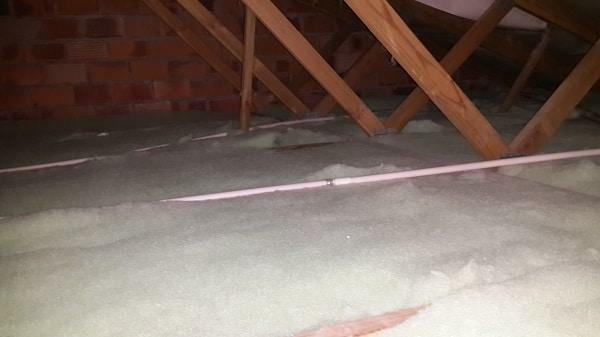 Insulation installers should be highly qualified to work in the roof space. Taking a walk in your roof space over the center section of the roof is one thing. However, when one starts lifting wires getting into little corners dodging water pipes etc it can be hazardous. For example, a water pipe (copper or PVC) can be damaged with the slightest of pressure. This can lead to thousands of Rand’s in damages before the water mains can be switched off. Make sure the Ceiling Insulation Installers that you employ for this task are adequately covered by Insurance so that you don’t end up paying for the damage. A well-insulated home will certainly give years of comfort and energy saving. VERY IMPORTANT: All electrical wires were possible must be lifted above the insulation. This is VERY IMPORTANT: All down-lights must have breathing holes an all transformers must be above the insulation. VERY IMPORTANT: All chimney flues must have at least 150mm gap around the chimney flue. Also, note that all extractor fans must have sufficient gap between fan and insulation.